Reagan Summerside here. I’m getting out my green dress and shoes and dying my hair green. 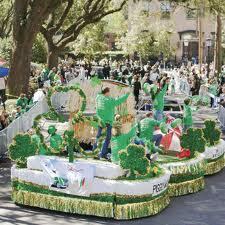 It’s spring in Savannah and that means we’re gearing up for our annual St. Patty’s Day Parade tomorrow! The parade and festivities are a really big deal here, second largest parade in the US! All the fountains are green and of course the beer is green. With a name like Summerside I’m not exactly Irish but like they say, everyone’s a little Irish on St. Patrick’s Day. Maybe this year I’ll even give an Irish jig a try. the parade of course and I’ll bring Bruce Willis, my rescue dog—not sure if I rescued him or he rescued me--to the parade as well. I bet they’ll be handing out green dog biscuits! Walker Boone, that handsome attorney who makes my life living hell, is having an open house tonight to celebrate the day. I’m not invited but I think I’ll crash the party. I’ve always wanted to see the inside of his huge house. Besides, I think I have the right since my divorce helped him buy the place. So, have you ever marched in a parade? 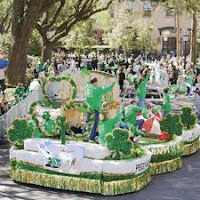 What about a St. Patty’s Day parade? Did you dye your hair green? Dance a jig? Have a party? Have a green beer? 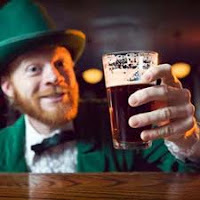 I've attended St. Patrick's Day Parade, but never marched in one, nor do I dye my hair green or drink green beer.